Okay, I’ve had a few people email me so far, and NO, I’m not showing you the original version, the dreaded “Birthday Cake Bag”. LOL. Let’s just forget it ever happened. 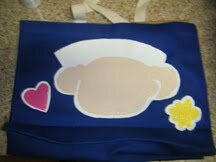 Anyway, right before Christmas break, I bought a second DARK BLUE, EVIL, CANVAS BAG from my daughter’s preschool. But this time, I had a plan…. 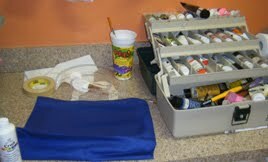 I used to do some acrylic painting and still have some of my supplies in an old fishing tackle box. I pulled them all out, a plastic plate for a palette ( you can barely see it here… it’s invisible! ), and a few paper towels. Oh, and a water cup for the brushes. 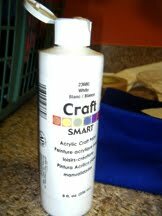 I bought this cheap, but really good acrylic paint in a bottle at Michael’s Crafts called “Craft Smart”. 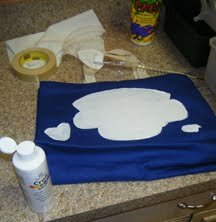 I also bought something called “acrylic medium” to mix in with the paint when using it on cloth. I never even used it though, so save yourself some money. Penciling out the design. I used a Prismacolor White pencil for this stage. I drew it very lightly, and “pumped it up” in Photoshop for you to see it here. Really, make it VERY light. And keep in mind that it’s a rough guide. A word of advice here… don’t get intimidated if you’re not very artistic. 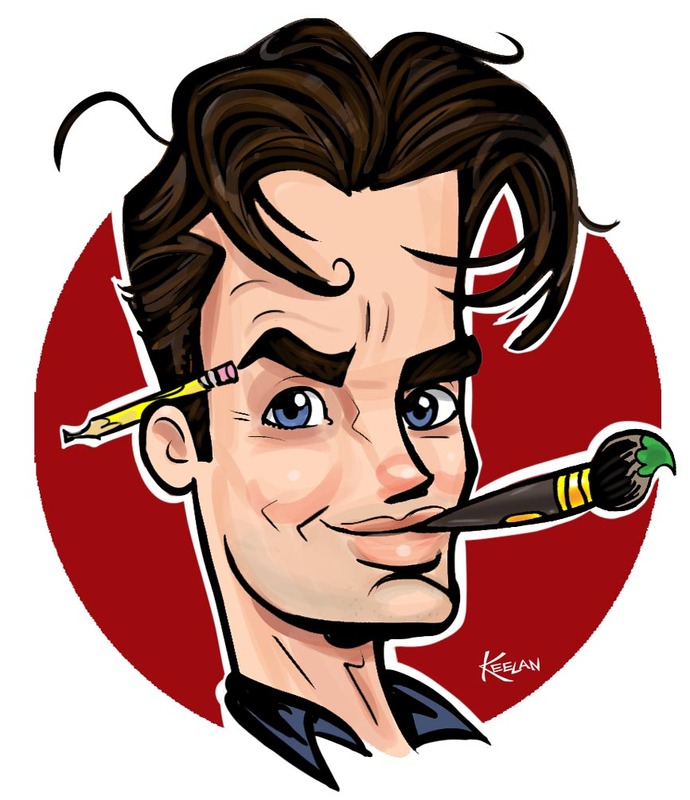 Remember, I draw for a living. Really, whatever you draw, your kid will be happy with. Just because YOU did it. 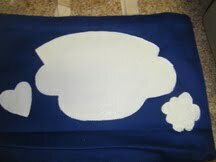 My daughter’s “Birthday Cake Bag” description of my first failed school bag decoration attempt just proves that. 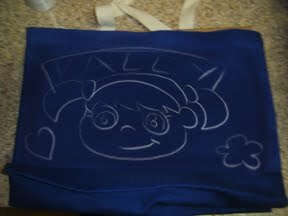 Since this is a canvas bag, I found on the first go around that it was hard to just draw on. 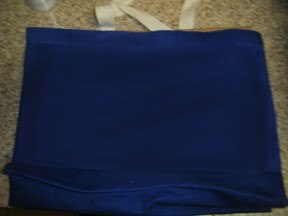 Add to that the fact that it’s dark blue, and it was a real challenge to get a marker to show up on it. So, this time I knew I had to have a lighter, smoother base to decorate. That’s where the whtie acrylic paint comes in. I painted a few layers of it over my rough sketch, keeping it as smooth and “un- bumpy” as possible. On this stage, I used my the “Light Flesh Color” paint I also bought at Michael’s to cover all the parts of my daughter’s head. You’ll notice I even painted what will be her hair flesh colored, just to make that area thicker and easier to draw on later. The toughest part was keeping the paint thick but also smooth. Acrylic can get “bumpy” and that makes it harder to draw on. Obviously I also put in the pink for the heart and the yellow of the flower. I decided on this bag to go ahead and leave a white “halo line” around everything as well, just to make the items on the bag “pop” when you look at them. This is the coolest thing ever! Your girls have to give you the best dad award for this! 😉 lol.